The map "Self-clarification conditions of surface waters" reflects the potential of natural waters of the territory to neutralize the introduction of pollutants into water bodies and to restore the original properties and composition of water. The self-clarification capacity of water bodies is formed by chemical, physical and biological processes; the dominant role here is played by dilution and oxidation. The process of dilution of pollutants with the waters of rivers and water bodies is directly dependent on the amount of water mass, and it can be characterized by the influx of water into a reservoir and the water flow rates in rivers during the minimum runoff (the largest environmental stress conditions). Given the lack of material on the inflow for the majority of the lakes, the evaluation of diluting ability was carried out according to the average annual water volume in the reservoirs. The oxidation of organic substances depends on the amount of oxygen from the atmosphere, and is determined by the conditions of mixing and temperature control of water bodies. The amount of oxygen required for oxidation of the process is specified as the biochemical oxygen demand (BOD5 and COD) and standardized for various substances at the water temperature of 20ºC. Because of insufficient data on BOD5 and COD, the oxidative reactions intensity was assessed indirectly based on the average temperature within the warm period and the intensity of water overturn. The water overturn in the reservoirs is influenced by the differences of density and dynamic parameters, such as churning, wind-induced surges, etc. The data on churning observations (as well as the inflow observation) for the waters of the Baikal region are not sufficient, that is responsible for indirect assessment of dynamic performance. Here, morphometric parameters are used as an indicator of overturn intensity, namely: the ratio of depth and area of the mirror, which characterizes the potential churning power. In watercourses the channel slopes are criterial for the overturn degree; the flow velocity depends on them. As a result, the assessment criteria of self-clarification conditions of surface waters are temperature, flow rate and volume of water, stream slopes and morphometric parameters of reservoirs. According to the regional dimension of the territory the analysis was performed for medium and large catchment areas of the rivers (4 – 6th according to Strahler’s stream order) and lakes. The parameterization of these characteristics is carried out with the help of statistical methods and comparative analyzes with the development of special scales and matrices. The inventory data on more than 200 waterways and 12 lakes and reservoirs of the Baikal basin was used for the map construction [Long-term…, 1986; Surface water resources..., 1972, 1973]. For most rivers on the territory the overturn intensity was determined for sections according to a longitudinal gradient. The range of slopes is divided into four groups: from the minimum values (0-2 ‰) for plain areas to the maximum (over 15 ‰) in the mountainous areas. The water temperature during the warm period was calculated as the average for four months (June - September), as on the rivers of the region's the water temperature transition over 0 °C is registered in May and October. The temperature scale is divided into three intervals - less than 10, 10 to 15, and above 15ºC. The water volume required to dilute pollutants was determined on the basis of the minimum 30-day river flow rates (seven gradations - from less than 10 to more than 800 m3/s) and the average annual water amount in water bodies (four gradations - from less than 10 to more than 500 m3). Determination of the self-clarification conditions of rivers and water bodies was carried out in stages. Primarily, transformation of pollutant by biochemical processes was estimated, and then pollutant dilution conditions were analyzed. As a result, four categories of self-clarification degrees of water bodies were defined. On the map the self-clarification conditions of water bodies are shown with colored along-channel linear curves and with shadings. 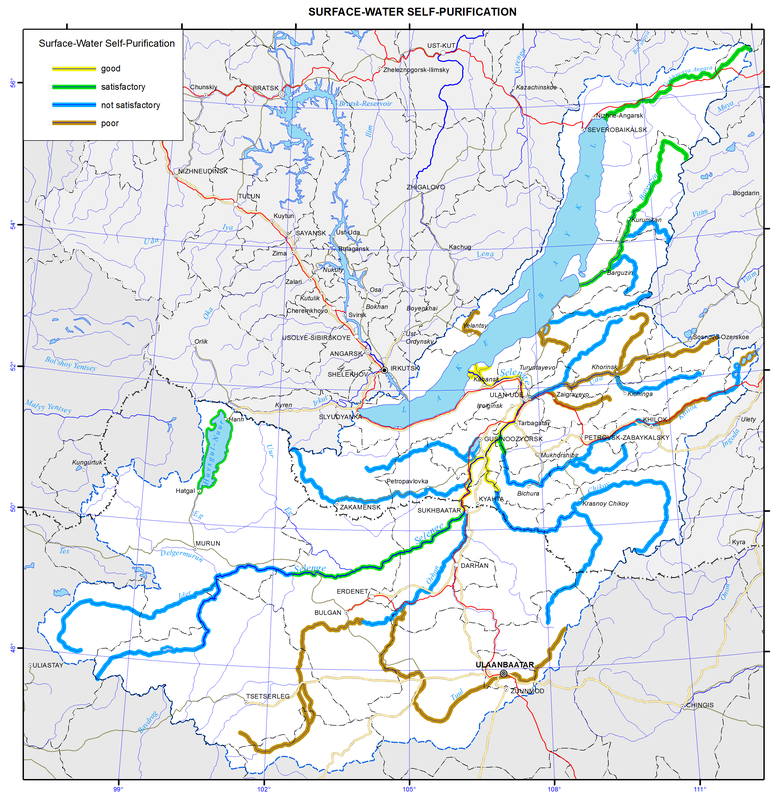 The most favorable self-clarification conditions within the Baikal basin develop in some areas of the Selenga river. Most of the water bodies of the territory are classified as having satisfactory conditions. The self-clarification capacity can be regarded as the criterion of sustainability (preservation of properties) of aquatic ecosystems to anthropogenic impact, and the map can be considered an element of environmental potential assessment of the area. Surface water resources of the USSR. (1972). Vol. 16, no. 3. Leningrad: Gidrometizdat, 595 p.
Surface water resources of the USSR. (1973). Vol.16, no. 3, Gidrometeoizdat, 400 p.